GOLDEN GIRLS: The winners celebrating with Berger execs and coach Connie Francis. IT was easily one of the most thrilling, nail-biting netball finals ever played on Jamaican soil. 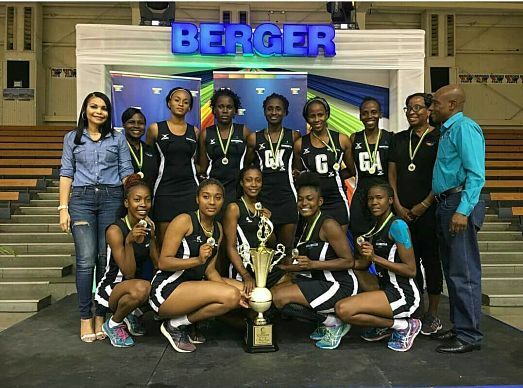 The defending champions, Kingston Hummingbirds, locked in a keenly contested battle of wills and skills against the Manchester Spurs to decide the winner of this year’s Berger Elite League. Before a lively crowd inside the National Indoor Sports Centre, both teams put on an outstanding display. Shooters Sabrina Spence and Shanice Beckford led the charge for the Hummingbirds, while Anna-Kay Griffiths and Jozelle Allison were towers of strength for the Spurs. Such was the quality of the contest that the score kept equalizing all the way up to the final whistle: 54-54. Extra time would have to show who wanted it more. And after two consecutive seven-minute halves, the Spurs surged ahead to claim victory, with the score reading 71-65. Spurs goal-shooter Jozelle Allison was voted league MVP during the awards presentation ceremony (medals, trophies, cash prizes) that followed.